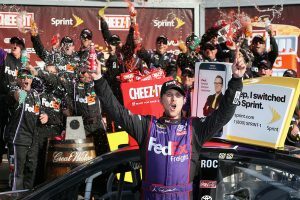 WATKINS GLEN, N.Y. — It shouldn’t be a question anymore that wherever the NASCAR Sprint Cup Series goes from week to week, Denny Hamlin will be a threat to score the victory. Hamlin proved that he has become well-rounded across NASCAR’s top level after scoring his first-career road course win in Sunday’s Cheez-It 355 at the Glen from Watkins Glen International. The Chesterfield, Va. native made his name and honed his talent on southeastern short tracks — among them South Boston Speedway, Langley Speedway and Southside Speedway in Virginia. But now, a little over a decade later, he has scored premier-level NASCAR victories at both the 2.5-mile Daytona Int’l Speedway and the 2.54-mile Watkins Glen road course, two extremely different circuits that make the bullrings he grew up on pale in comparison. His effort at Watkins Glen avenged a bitter defeat to Tony Stewart at Sonoma in June, when Hamlin was rooted out of the way in the final corner and Stewart went on to take the win. This time, however, Hamlin had his day. He took the lead on a restart with 10 laps to go, after Brad Keselowski and Kyle Busch got together exiting turn one, and never gave it up the rest of the way despite two late cautions and a race-deciding four-lap sprint to the finish. Driving the No. 11 FedEx Toyota Camry for Joe Gibbs Racing, Hamlin’s victories at the ‘World Center of Racing’ and Watkins Glen this season were his first at both circuits. With the breakthrough efforts, he also knocked the list of active Sprint Cup tracks he is still winless at down to seven. Hamlin is still looking for victory at Sonoma Raceway, Dover International Speedway, Indianapolis Motor Speedway, Charlotte Motor Speedway, Las Vegas Motor Speedway, Kentucky Speedway, and Auto Club Speedway. Having been so dominant at such a diverse slate of tracks, Hamlin has established himself as a threat at virtually every active track — proving proficient at restrictor plate racing, road course racing, short track beating-and-banging and intermediate track warfare, alike. Though the Sprint Cup field is nearing the postseason stretch, Hamlin still has opportunities to check Dover (October 3) and Charlotte (October 8) off of his to-do list. Making his odds better to accomplish that feat, he has a combined three victories in the NASCAR XFINITY Series between the two tracks. However, checking off race tracks from the win list isn’t the bigger picture. Yes, Hamlin has 28 Sprint Cup Series victories at 16 different tracks (which ties him with former Cup champions Kurt Busch and Rex White for 25th on the all-time wins list) and an additional 17 wins between the XFINITY and NASCAR Camping World Truck Series, but he is missing one thing from his racing resume — a NASCAR national series championship. And for the short track ace, that is where his focus will shift to as the Chase draws nearer. Having diverse tracks in the Chase — such as Dover (a mile track), Martinsville (a paperclip half-mile) and Talladega (a restrictor plate circuit) — will help Hamlin, who hopes to utilize the diversity in skillset that he has displayed this season, to make a push for his first Sprint Cup championship. Keep in mind, Hamlin led the points entering the series’ final race at Homestead-Miami Speedway in 2010 and couldn’t seal the deal, losing out to Jimmie Johnson after an early-race incident. This time, I believe he’s wiser, stronger and better prepared to lay siege to NASCAR’s ultimate prize. Not to mention, he has the strength of JGR behind him, which has a combined 10 Cup wins and 13 XFINITY victories this season alone and is prepared to make a full-court press for a second-straight Cup title (after Kyle Busch’s improbable comeback last fall). If he continues to show strength on the track each week, whether the series is competing at a short track, restrictor plate oval or an intermediate facility … then Hamlin could well be store for a huge season-ending payoff. And the word diversity may just be the key that opens the lock on the vault. Marshall Gabell is the Mid-Atlantic Correspondent for Race Chaser Online, and was also formerly the public relations director for NASCAR Next member Austin Hill. Gabell is currently attending Stephen Decatur High School in Ocean City, Maryland, completing his sophomore year. He is just 15 years old.